We are the leading manufacturer and supplier of Rite Steel. The Rite Steel we offer are completely customise artistic, durable and with inbuilt stability. There innovative state of art technology is faster for manufacturing and erecting buildings. Using the core strength of high tensile steel, it allows multiple applications across commercial and residential sector. We offer complete turnkey solution from planning, designing, manufacturing on-site installation to meet your project requirements. These products can be availed from us at reasonable prices. Our company is offering superb RiteSteel (Light Gauge Steel Framing Solutions) throughout the various infrastructure projects. We offer complete turnkey solution from planning, designing, manufacturing, on-site installation to meet your project requirements. The ritesteel structures are completely customized artistic, durable and with inbuilt stability. 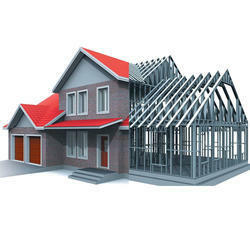 We are able to develop the building in no time, using superb grade steel. The light gauge steel frame system allows multiple applications across commercial and residential sector.